Most people wish they were more productive. Some buckle down and leverage some rare facet of their personality to force the work out. Some of them talk with friends. Some go on vision quests. There are lots of methods for lots of types of people. Most hackers, I’ve noticed, look for a datasheet. An engineer’s reference. We want to solve the problem like we solve technical problems. It’s got the cover equivalent of click-bait, but the centimeter thick bibliography listing research sources at the back won me over. There were three books that gave me the first hints at how to look objectively at my brain and start to hack on it a little. 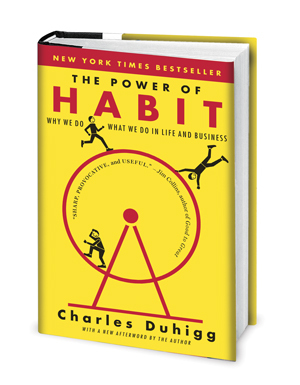 These were The Power of Habit by Charles Duhigg, Flow By Mihaly Csikszentmihalyi, and Getting Things Done By David Allen. I sort of wandered into these books in a haphazard path. The first I encountered was The Power of Habit which I found to be a bit of a revelation. It presented the idea of habits as functions in the great computer program that makes up a person. The brain sees that you’re doing a task over and over again and just learns to do it. It keeps optimizing and optimizing this program over time. All a person needs to do is trigger the habit loop and then it will run. For example: Typing. At first you either take a course or, if your parents left you alone with a computer for hours on end, hunt-and-peck your way to a decent typing speed. It involves a lot of looking down at the keyboard. Eventually you notice that you don’t actually need to look at the keyboard at all. Depending on your stage you may still be “t-h-i-n-k-i-n-g”, mentally placing each letter as you type. However, eventually your brain begins to abstract this away until it has stored, somewhere, a combination of hand movements for every single word or key combination you typically use. It’s only when you have to spell a new word that you fall back on older programs. The box has two modes: in SOPA mode, the whole Internet is at [Brad]’s fingertips. In NOPA mode, an Arduino communicates with a Python script running on the router to pull up an Internet blacklist. A simple button would be too easy to override, so there’s a ‘nuclear mode’ that shuts off these time sinks for one hour. The only way around the blacklist is to restart the router, a process that takes 15 minutes and will kill the entire Internet for the duration. Not something you’d like to do if you’re slightly bored. All the code for the SOPA box is up on github and you can check out [Brad]’s demo of the SOPA box after the break.